Are you guys OK if I don’t take pictures of all the worksheets and the construction paper verses that EJ and I do? I keep forgetting to take pictures of them, and then when I do take pictures, I’m a couple weeks behind… yadda yadda yadda. If you really want to see them, I’ve got a post in drafts just waiting to go… no? ‘K, then! “The Lord bless you and keep you.” Numbers 6:24. This has been one of my favorite verses for years, and I thought our “K” week would be a perfect time to introduce this to EJ. We’ve been talking about how God will keep him safe through all his 2 year old fears, and I love that this verse is a reminder of that as well as a blessing. As EJ grows, I pray that he will really see the depth of how the Lord will keep him. Now, I’m excited about what I’m about to share – it’s not a craft that EJ was able to participate in with me, but the use of it has already provided hours of fun and pretending. Presenting… King EJ! Every King needs a crown, and this was so much fun to make. Seeing EJ’s face when I gave him his crown – priceless! After carefully inspecting his King’s crown, EJ switched into full on King mode. Since I made a crown for Dieter, too, I had to wear it and be King Momma. Which was fun, too. Notice how King EJ is going shirtless these days. Perfect for the cooler weather hitting us now. There are a lot of different ideas for making crowns floating around online these days, and of course, nothing beats construction paper crowns. I’m in love with sewing felt right now, so when I got this bug in my brain, I had to make it. I’m thinking about posting details on how I made these little gems on my craft blog, so I’ll let you know when I get my act together and post it over there. 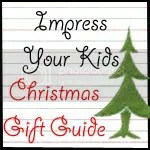 Just found THE CUTEST Thanksgiving crafts from my friend Isabel at alphamom.com. 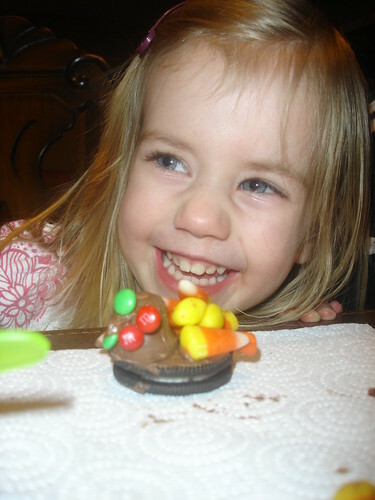 I think it’s time for Thanksgiving-table-craft-take-two! At our house, Thanksgiving is a REAL meal. We dress up, we use china, cloth napkins and all sit around a decorated table. My husband’s family uses mismatched plates and paper napkins…but that’s another post. Anyway, this year I wanted to make something with Lydia that we could use on the table. 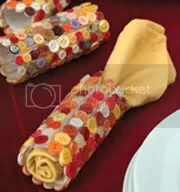 Place cards or napkin rings or even a centerpiece. I just didn’t want it to be…well, you know…ugly. 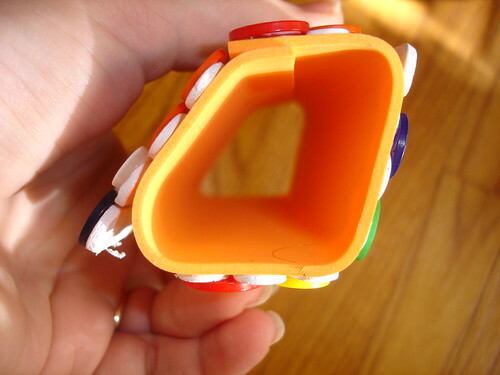 So, I was overjoyed when I saw this cute napkin ring craft over at Family Fun! 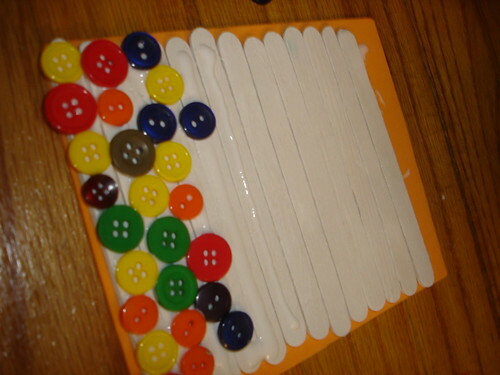 You use buttons lined up on popsicle sticks to make some “Indian corn”. I love it! Buttons are a weakness of mine and I knew Lydia would enjoy gluing them. 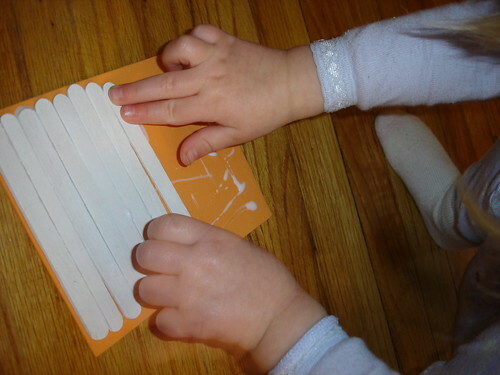 The original instructions suggested using 12 popsicle sticks on top of a 4×5.5 piece of felt. I decided to use fun foam instead. 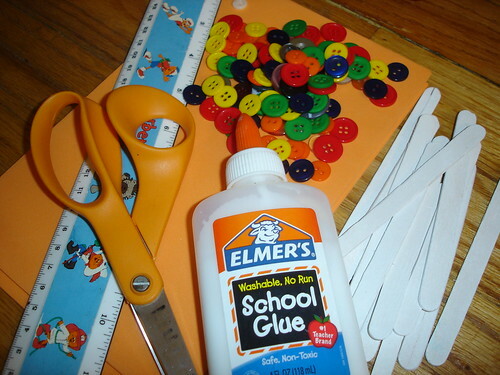 Then we started gluing on the buttons. It is important to glue them straight down the popsicle sticks. This gives you the little rows of corn. So, we glued them as straight as we could. Then I realized the buttons were too big for the popsicle sticks. Even though we were gluing them straight, they were still overlapping onto other sticks. Well, we kept going anyway and then let it dry. Then I tried to roll it up and admire our Indian corn. Only it wouldn’t roll. It looks more like…I don’t know, a trapezoid of buttons. But certainly not anything remotely related to the corn family. Not to mention half the buttons popped off. 1. Make sure your buttons are smaller than your popsicle sticks. 2. Make sure your buttons are all the same size. 4. Block off at least 2 hours. Unless you’re just eating Thanksgiving dinner with a family of 2. Because this takes a long time. 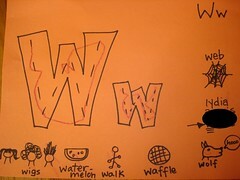 There are so many great “w” words. Besides the ones I expertly drew to the left, we also thought of several more. Most of which are escaping me right now. The first idea that popped into my mind for a verse was something that had to do with “wait”. Goodness knows that Lydia needs to learn a thing or two about waiting. But the only thing I could really find was about waiting on the Lord. And really, I need her to wait on me. Ahem. Me: It’s like a fight. Me: It’s someone bad who might try to hurt you. Lydia: No one hurts me. Me: That’s true. But sometimes other things can be our enemies. 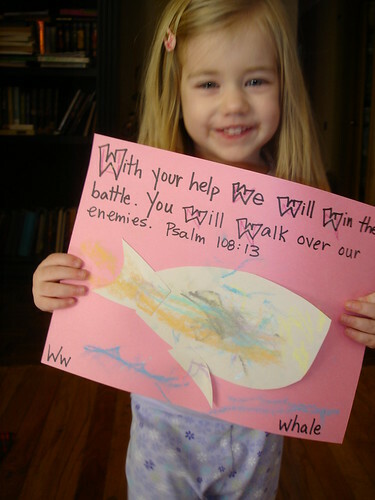 Like this: With Jesus’ help Lydia will win the battle. Jesus will walk all over her fear. Lydia has a tendency to be shy and fearful. I think this verse is easily seen as big battles and fights. But for my 2 year old, fear is her biggest battle. I hope this verse buries itself deep in her heart. So, we made a whale instead. I cut out a (very true to life) outline of a whale. I let Lydia piece it together and then color it with chalk. This was a hit! She absolutely loved it! And then I showed her how to smear it with her thumb. And that made it even cooler. I’m looking forward to the rest of W. I’m thinking about doing something for “week” because Lydia is really interested in the calendar. And maybe even Jonah and the whale (I know, it was really a big fish, but still…). 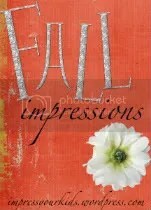 Don’t forget about our Fall Impressions carnival tomorrow! Link up and show off your creative Thanksgiving stuff!